Raw, wild and prehistoric, there is nowhere on the African continent that quite compares with the rugged grandeur of Namibia – and this itinerary is the ultimate introduction. You’ll visit untamed Kaokoland where you’ll be able to watch lions, leopards and elephants roaming freely across a vast and undisturbed landscape. You’ll also sleep in a luxury safari chalet surrounded by the moonscape environment of isolated Kunene – home of the indigenous Himba people as well as fascinating collection of desert-adapted wildlife. Flights and full board at &Beyond Sossusvlei Desert Lodge, Hoanib Valley Camp and Serra Cafema. Based on two people travelling. You fly overnight from London Heathrow, arriving at Johannesburg the next morning to connect with your onward flight to Windhoek. You’ll land in the early afternoon, where you’ll be met and driven to your luxury lodge set on the private Zannier Nature Reserve north-east of Windhoek. You can relax after your flight by the pool or venture out on guided game drives. You’ll be able to delve deep into the desert on quad bikes and in open 4×4 safari vehicles, or in air-conditioned luxury to explore Sossusvlei and the Sesriem Canyon. Guided nature walks, stargazing expeditions and desert picnics will reveal even more of this astonishing region. Opt for a hot air balloon ride or flight safari for a different perspective of this incredible landscape. 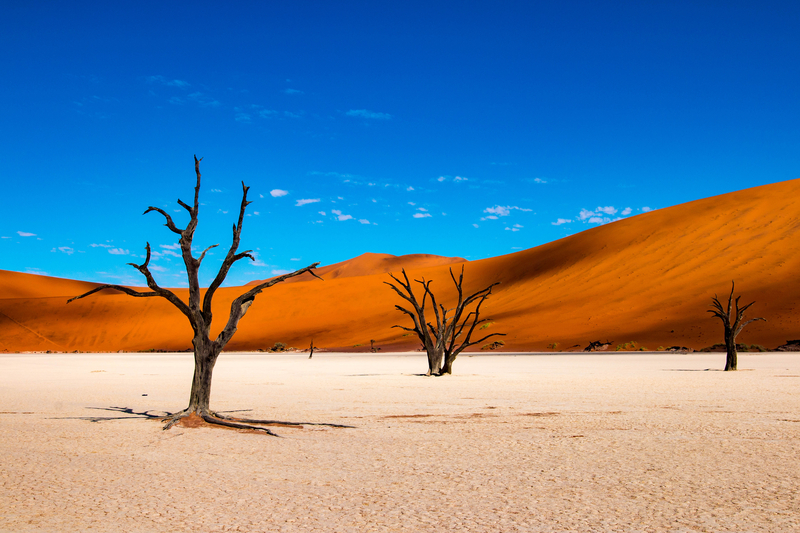 From Sossusvlei, you’ll catch a flight to Sesfontein and be transferred to your camp in Kaokoland, a rugged and truly unexplored wilderness where you’ll find dramatic mountains, rolling sand dunes and incredible desert-adapted wildlife. You’ll fill your days with game drives and walks along dry riverbeds in search of lions, giraffes, elephants, springbok, oryx and the endangered black rhino. For those interested in culture, visits to local Himba and Herero communities can be arranged – a great opportunity to get a deeper insight into life in this remote region. Today you’ll fly to Kunene for some serious wildlife and landscape viewing at Serra Cafema. You’ll be staying in the heart of Damaraland close to the Kunene River that forms the border between Namibia and Angola. It’s a fascinating area where the flat desert scrub is transformed – almost before your eyes – by the seasonal rains. You’ll meet the traditional nomadic Himba people and see fairy circles as well as herds of gemsbok, springbok and mountain zebra. Not to mention great colonies of Nile crocodiles and exotic birds like Burchell’s courser and the Benguela long-billed lark. Your remote safari camp sits on the banks of the Kunene River, giving you a real sense of adventure amidst a region of bizarre moonscapes and eye-stretching mountain views. Enjoy boating along the river, insightful nature drives and hiking in the valleys. Your Namibian adventure comes to an end. Catch a light aircraft flight back to Windhoek international airport. From Windhoek, you’ll fly to Johannesburg and connect with a British Airways flight back to London Heathrow.